Description: VGL-20015 Hermann H. Heiser Single Loop Side Holster #907 Here we have the pinnacle of Gun Leather collecting a Hermann H. Heiser #907 Single Loop Side Holster with the Bulls Head design on the Loop. This awesome H. H. Heiser #907 Side Holster is in 95% New Condition this holster is the finest I have seen in this design showing minimal signs of wear a truly beautiful piece of artwork in leather. The last time I had the opportunity to even buy one of these holsters was 4 years ago and I have not seen any since. The Hermann H. Heiser Bulls Head Single Loop Holster is pictured and described in great detail in the book Packing Iron on Pages 183 and 186 which is widely regarded as the finest research on American Old West Gun leather. The Hermann H. Heiser Company made this #907 Side Holster to fit a Colt or clone Single Action Revolver with a 5 = barrel length for the right hand shooter. The Hermann H. Heiser Company changed the #907 holster in the late 1920s, the #907 and the #407 no longer came standard with the tooled Bulls Head on the loop. When this design was being made prior to 1919 it was holster #200 in the H. H.Heiser holster line. 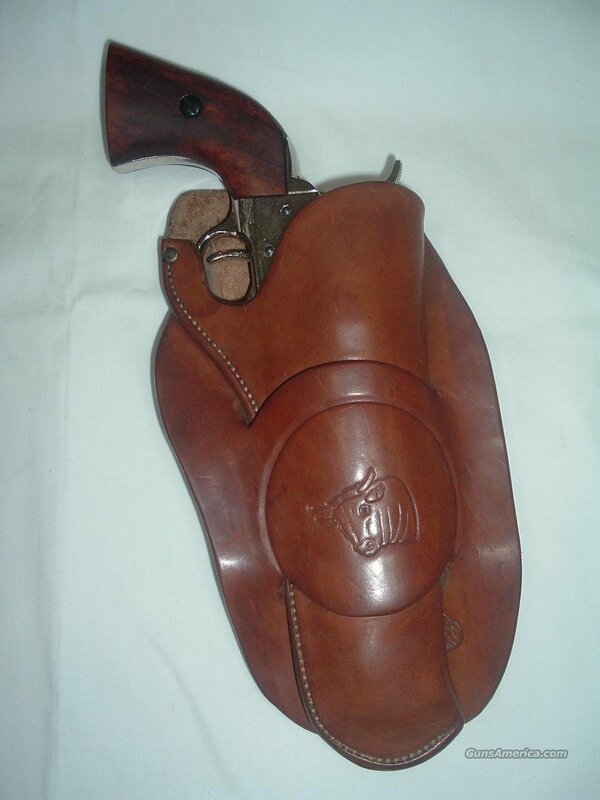 The Hermann H. Heiser Company made the #907 Side Holster from medium weight oak tanned California skirting leather showing the standard oval H. H. Heiser Denver Colorado makers mark logo which dates this holster from 1925 to 1955.PLEASE CALL US #888 653 8723 WITH ANY QUESTIONS YOU MAY HAVE ABOUT THIS ITEM OR ABOUT This auction is for Holster only firearms are not included. We are Old Trading Post, Inc. we are a multiple website Old West outfitter, Saddle makers and Gun Leather is our main business. We also have a website Vintage Gun Leather where we specialize in Antique or Vinatge specialty Gun Leather from the famous makers of the Old West and early 20th Century.